Dupa ce v-am propus intalnirea cu cristalul de Boemia, e timpul sa ne indreptam spre celelalte comori din Jablonec nad Nisou. Jablonex Group este firma responsabila de productia si dezvoltarea unor vechi traditii – bijuterie, sticla, margele si monetarie. Renumele departamentului de bijuterie, ce leaga tehnicile traditionale de prelucrare a sticlei din nordul Boemiei de tendintele modei si ale designului, se datoreaza in mare parte metodelor de lucru si varietatii de modele manufacturate. De curand alte doua branduri de lux s-au alaturat portofoliului de bijuterie de moda a grupului Jablonex – Amorike si Fried Freres, firma franceza cu o traditie de 120 de ani pe scena modei pariziene. Departamentul de margele este unul dintre principalii furnizori de margele de sticla pe plan mondial. Iar specialitatea locului sunt margelutele mici (rocailles), aflandu-se pe locul 1 in lume. Traditia crearii lor merge inapoi in timp in secolul 16, iar in ultimii 50 de ani, Jablonex a exportat margele mici in peste 80 de tari. Jablonex Group is the company representing and further developing the unique tradition of glass and jewellery production in the Jablonec region, that is represented also in the Bohemian Crystalware Exhibition recently taking place in MNaR Bucharest. Jablonex Group is organised in four divisions: Jewellery, Glass, Beads and Czech Mint. for the North Bohemian region, can be attributed mainly to the superior quality of traditional workmanship and a variety of jewellery and garment components manufactured. Recently, two new luxury brands extended the Jablonex Group portfolio of fashion jewellery – Amorike and Fried Freres. The Amorike collection has been designed exclusively for the Jablonex Group by renowned Czech designer Rony Plesl. The French corporation Fried Freres, which celebrated its 120th anniversary last year, belongs to traditional suppliers of fashion jewellery to prominent Paris fashion houses. technology, appearance, product range or features. The tradition of seed beads production dates back to the 16th century, and for the past 50 years, seed beads have been exported under the Jablonex brand to more than 80 countries of five continents. 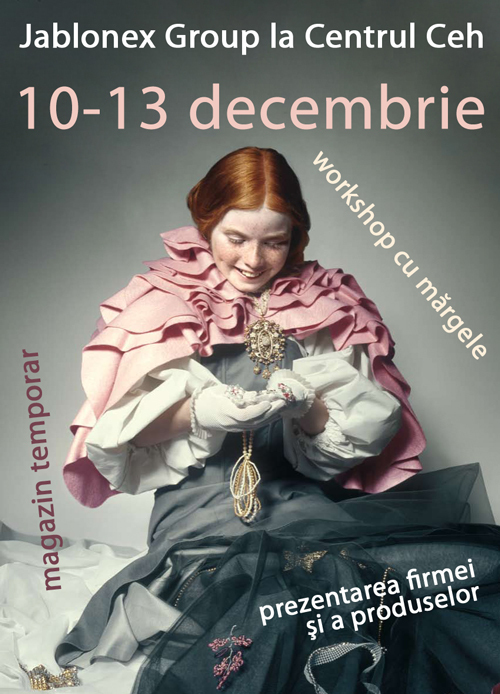 To enroll to the workshop please white to our colleague Adela – hruskovaa@czech.cz some information about yourself and your interests in this workshop.